The removable Front Gate (included) allows for larger loads and quick, easy, controlled dumping of soil or mulch. When you are done, just use a garden hose to clean up without any worries about rust. 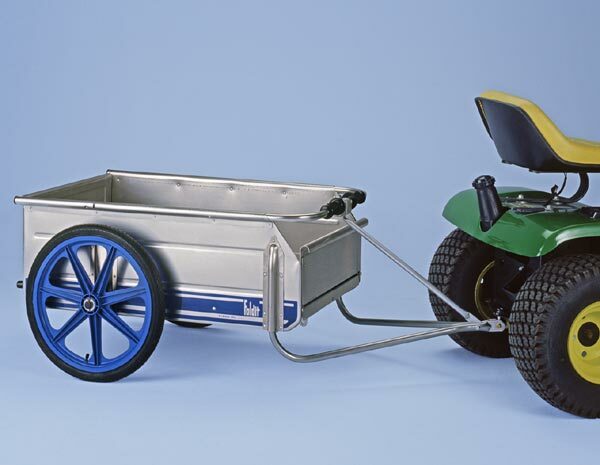 With the optional riding lawn mower trailer hitch, the Foldit Cart can be towed around the yard or farm. 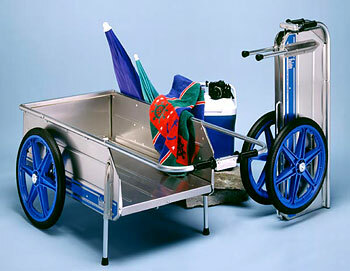 Standard Foldit Cart, assembled and ready to use, in Blue Stripe with Blue Wheels. Standard Foldit Cart, folded for convenient storage, in Green Stripe. 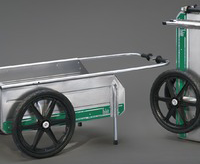 THE COLLAPSIBLE CART THAT'S BIG ON HAULING, AND SMALL ON STORAGE! 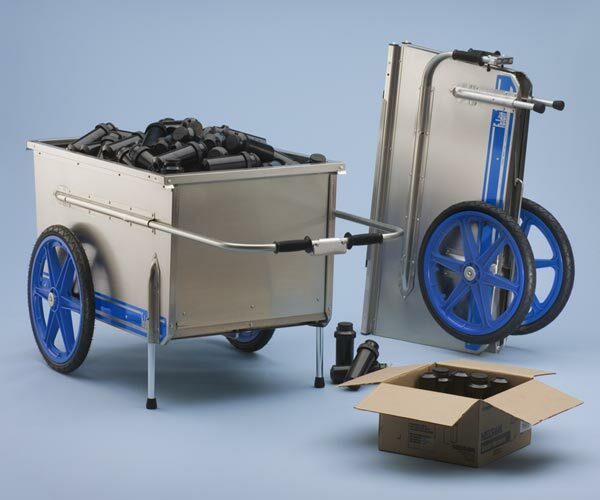 The Foldit Cart can be used for more than household chores; use it on the jobsite or for recreational purposes. 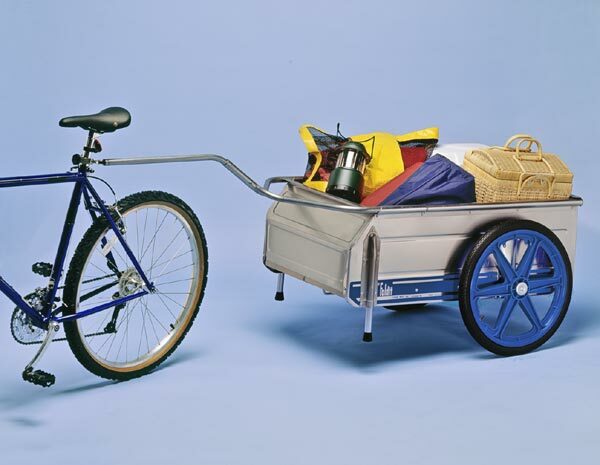 The Foldit Cart is ideal for boating, camping and bike trips (when used with our optional Bicycle Hitch). 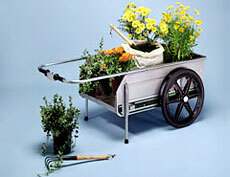 The Foldit Cart is the hardest working all-purpose carrier you will ever own. With the do-it-all Foldit Cart, you can haul almost anything! Why strain yourself when you can Foldit? Move up to 330 lbs. of cargo at a time, with hardly any effort. The Foldit Cart is designed so loads are dispersed evenly over the axles; 20-inch wheels with pneumatic tires* add maneuverability and stability over uneven terrain. Airless Foam-Filled tires, ideal for rough, thorny terrain, are available for a small additional cost. It collapses small enough to fit in the trunk of your car, so it goes with you wherever you go. The high-grade marine aluminum construction is completely rust and corrosion resistant, even after years of exposure to saltwater. 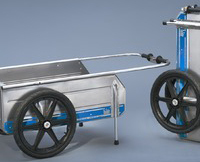 When not in use, the retracting handle locks firmly in place, keeping the cart folded. Store it in the closet, garage, storage shed, wherever... its compact size requires less than 2 square feet of floor space. Just release the spring action handle to initiate unfolding and the Foldit Cart is ready to work in less than a minute. 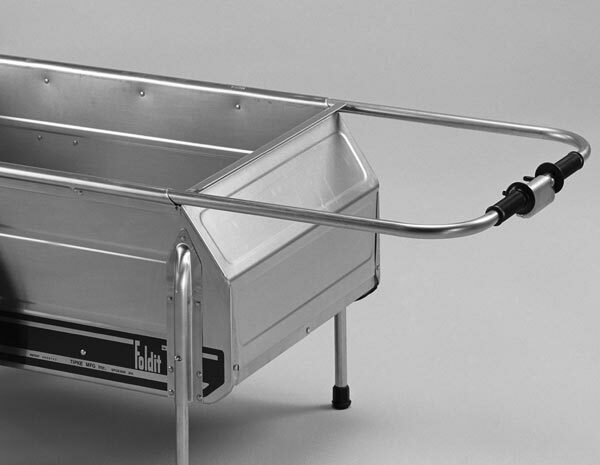 The Industrial Foldit Cart hauls up to a remarkable 9.5 cubic feet of cargo. Uses only 2 square feet of floor space when folded. Weighing only 42 pounds, this lightweight, rugged, high-quality aluminum cart has an extra-deep bed ideal for moving the most cumbersome of loads. The Industrial Foldit Cart comes standard with 2 removable gates, so filling and dumping loads can be done without difficulty. Why not save yourself the time and effort of moving multiple loads and GO BIG! Weighs Only 42 lbs, but can haul up to 330 lbs. All Foldit Carts & Accessories come with a Limited 2-Year Warranty.